I recently found this photo of a bridge-style turntable from the Colorado & Southern roundhouse in Denver. If there is a more-correct technical term for this type of turntable I'd appreciate to know it. Just out of curiosity, I was wondering if anyone here could provide any information on this type of turntable. Specifically, I'm curious about what railroads and/or regions commonly used this design. When you think about it, all turntables are bridges, in fact, that's the proper name for the movable part that supports the track. The turntable bridge spans between the end trucks and center bearing. Like any other bridge, the beam can be below the rails (deck), alongside the rails (through), or replaced with trusses above the rails (through truss). Most turntable bridges are the deck style because they use less material.The decision to use a through style is usually based on the soil and drainage conditions that dictate how deep a pit is practical... thin soil over solid rock or difficulty keeping a deep pit from flooding dictate one of the through styles. In various publications like Trains Magazine, I've seen those turntables on the Burlington Route referred to as "through-truss turntables". They're most associated with the Burlington Route and their subsidiaries like the C&S, but I'm sure that they weren't limited to just that line. At least one survived in use until recently in Aurora for BNSF, but judging by aerial images available online, it was removed sometime between 2007-2009 and the pit filled at the former roundhouse site at Eola Yard. Is this turntable you linked to still around? If it's the one I'm thinking of, it was integrated into an amusement park that was built around the former rail facility until Six Flags bought the park, and then dismantled and donated to the Cumbres & Toltec. But I haven't heard anything about it in over a decade. Yes, I found the photo of this turntable in a thread about it being at the Cumbres & Toltec. The fact that turntables such as this being more common in areas that might have more solid rock or be more prone to flooding makes sense. I'm assuming the pit for this style of turntable would not be as deep? Most info I've found indicates that the CB&Q was known to use them. Based on the other info above, it seems like railroads in places such as Florida or Louisiana (thinking marshy, etc) would also have found use for them. Are there any other known examples? The yard is in the river bottom, and I suspect high water table is the reason. There is a similar 100 foot Frisco turntable at the Museum of Transportation near St Louis. It came from the Lindenwood Yard nearby, and is another example that was used where a deep pit wasn't possible due to high water table or rocky ground. 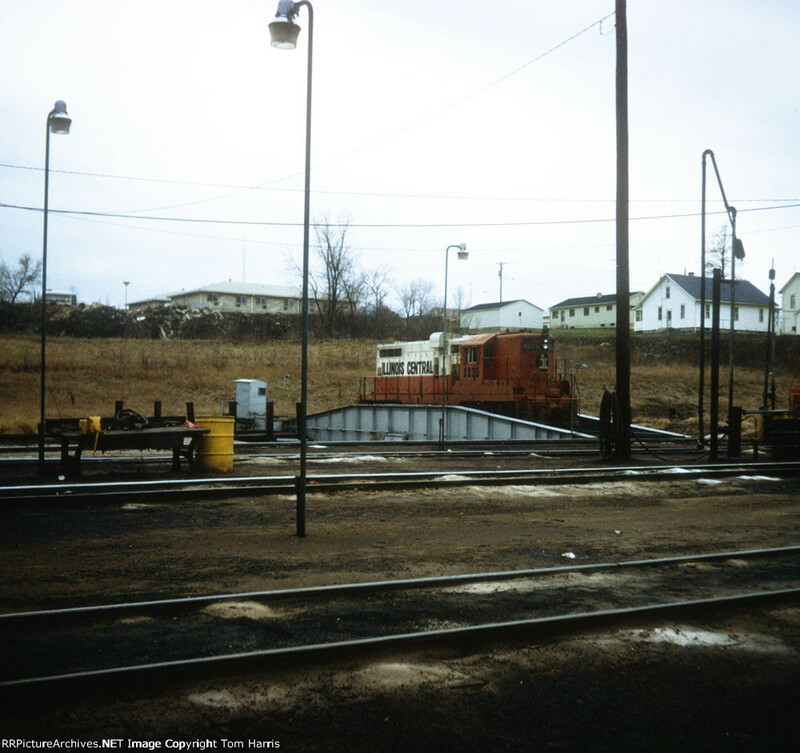 The old turntable at Jim Thorpe PA (ex-CNJ I think) illustrates the problems of a turntable in a high-water table area back in 1991. Not so much high water table as blocked pit drain pipes, I think. The yard at Jim Thorpe is several feet above the high-water level of the Lehigh River, about 600 feet away.